The Cornish charity Shelterbox is sending hundreds more boxes of aid to the Gulf coast of the US to help those left devastated by Hurricane Katrina. The Helston-based charity has already sent 300 boxes to Houston where they will be distributed to areas of need by local charities. Volunteers are spending the weekend packing a further 200 boxes, funded by American Rotary clubs. Vital water purification equipment is among the supplies in each box. The boxes contains a tent, sleeping bags and enough water purification tablets for 20 people for six months. Containers, cooking sets, torch, rope and basic survival items are also included. 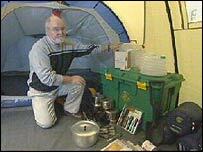 Shelterbox is run by the Rotary Club which has a large network in the US to help the distribution of the aid.